It is a blend of 100 percent organic and wild-crafted whole foods - it does not contain any synthetic vitamins, chemicals, or preservatives. It does not contain any fillers. Many green food supplements contain large amounts of apple pectin, rice starch, bran, lecithin, ground seeds, grains, and other materials that allow manufacturers to include less expensive green vegetables. Our green food formula has only organic and wild-crafted green vegetables, which makes it extremely dense in nutrients and effective in supporting optimal nourishment and cleansing. It contains a comprehensive probiotic formula, providing friendly intestinal bacteria that are vital to supporting optimal immune system and digestive health. It contains a comprehensive mixture of digestive enzymes that can enhance digestive efficiency and decrease unnecessary burden on your digestive organs, particularly your liver and pancreas. It ensures optimal nourishment of your cells with the numerous health-promoting antioxidants and phytochemicals that naturally occur in green vegetables. These micronutrients are easily absorbed into your bloodstream, much like the nutrients in freshly pressed green vegetable juices. Ounce for ounce, it is one of the least expensive green food products available throughout North America – remarkable when you consider its exceptional nutrient-density and filler-free status. Approximately 33 pounds of fresh organic greens go into producing each pound of organic green food powder. It comes in an amber glass jar with a metal lid, both of which ensure optimal preservation of the nutrients in this organic blend. Suggested Usage: 9 capsules daily. If you experience temporary beneficial cleansing reactions such as loose stools, reduce daily intake to one capsule, and increase gradually to 9 capsules daily over a two-week period. Because this super green food formula is made exclusively with organic food, it is non-toxic and can be taken in larger amounts if intense cleansing and nourishment are desired. My family just received more GREENS. I can't believe how fast they came - Thank you, we were completely out! I swear the GREENS and your Vitamin C have kept my Dad alive. He has peripheral neuropathy and takes a shocking amount of pharmaceutical drugs on a daily basis, including Methadone for his intense chronic pain. When he ran out, he got so sick within days. I had to overnight him the GREENS and Vitamin C and he was so much improved within just a couple of days! Also, I have a kitty that almost died twice due to a heart condition. She was given less than a 1% chance of survival. She survived and we took her to a cardiologist who said she may not live a month. That was almost a year ago and she is going strong. I don't know if I am supposed to, but I put a small amount of GREENS into her all-natural organic kitty food a few times a week and I bet she is doing so well because of it. IT IS MIRACLE FOOD! I have had my daughter on the Vitamin C and GREENS since she was a little baby and she is so healthy and strong. People ask what my secret is and I tell them I avoid conventional doctors and all doctors unless she is sick, which is virtually never, we do not vaccinate and give her GREENS and the Vitamin C daily. They say yuck and most are shocked and some appalled, but she loves them mixed in some juice and the proof is in the pudding. If I forget to drink my GREENS and Vitamin C, I feel like I am run down in just a couple of days, so does my husband and my business partner. We eat almost completely organic and natural healthy foods, so you would think that was enough, but it's not. I swear by your products and appreciate you taking care of my family, even if it is from afar. I have just re-ordered your greens, thank you for recommending this product. Before trying it, I literally had no energy. I could work, but not much else - it was a challenge to get out of bed. My quality of life was nonexistent. Now after 3 weeks, I am a different person. I didn't have to make an effort to change my diet, once I began to take the greens, the cravings for starches and sweets diminished, and I mix it with plain water only. I have suggested that my mother take it as well, and she also thinks its great. Best of health, wealth & success to you and your family. I love to use it in my son's smoothies. It is a great way to get green nutrients in his diet since the mere smell of broccoli and spinach makes him gag!! I feel so relieved when he slurps down the last bit of smoothie made with raw chocolate powder and a teaspoon of super green food...he usually asks for another one!! Love the product. I drink it mixed with 4 ounces of chilled filtered water. I use a small shaker cup and love the taste of it pure. It gives me comfort knowing that so many good things have entered my body and I feel better when I take it on a daily basis. For about three weeks I actually took it twice a day to give my system an extra cleanse and boost. Simply the best there is! Very good. Makes me feel very energetic. It appeared to cut my craving for sweets and offered some assurance of proper nutrition while on the road. I definitely notice a different with my immune system when I am taking this. As a teacher, I am always around kids and their germs. As long as I take this, I hardly get sick. My husband and I have been using this product for about 2 years. We seem to never be sick and we are in our 60's, so that's a good thing. We add flax seed and a banana. We use water as we are not juice drinkers. I add the super green food to smoothies and sprinkle it over my pet's food. My energy level has increased and I feel better overall. My dog is just the picture of good health. Her coat is glossy, her eyes are bright. Thank you for this great product. I started using this product in 2005. I haven't had a sinus infection since and I've only had one cold. No kidding! And I believe that cold was due to a highly stressful family event that drained me emotionally. I attribute my strong immune system to this product because the large amount of probiotics it contains keeps my body strong and able to fight off bugs and viruses I may encounter. I do believe it needs to be taken daily--not just in the winter. I use greens every day, usually in the morning. I am 52 years old, no weight or other health problems and I strongly feel greens are part of my excellent health. My body feel strong like it's saying "this is what I really need to be that way." I try to eat mostly organic food but living in Alberta means very seasonal and limited choices. Green food is what fills the gap between summers. I am a huge fan of the super green product. This year I haven't had as much trouble with my allergies as in the years past. I have been using the greens for quite a while and truly believe that it has helped me get through two separate cases of Lymphoma. This is the only food supplement that I would consider a must for everyone. I 've used almost every green drink product on the market and Dr Ben Kim's is the purest and best value. Best thing a person can put in their body. Yes, loving it. I've only used it a week, but it is superior compared to other Green Formulas. I am alert in the afternoon. It gives me energy in the a.m. and I feel like I am doing something good for me. I am hoping to realize more benefits the longer I am on it. I mix the Super Greens into vegetable juice for breakfast. Using it keeps my intestine in the great condition it is in after my fast at your clinic, even on occasions when I eat things I know I shouldn't. From the Glass bottle to the quality ingredients and the speedy delivery I don't think there is a better Super Green product on the market today. Have been using it for three years and will continue to use for the rest of my life. I like the fact that it is raw, organic and tasty in my smoothies. I use it religiously and have found it to cure a scalp problem I have. In an ever tightening economy, it has become necessary to eliminate many "essentials" from my budget. One item I have NOT and will not delete, is Dr. Kim's Super Greens. I have taken greens since the mid-80's, including barley, wheat grass juice, super blue green algae, spirulina, etc. Now that I've discovered Dr. Kim's super green food product, all the rest are history. This product has everything my body needs for optimal health, with no additives or fillers. Of all the green products I've tried, this one seems to be the best. My husband says it keeps him regular. We seem to get sick less or not at all. I love it! I have a spoonful a day in water along with a spoonful of the vitamin C powder. I am rarely sick, and when I do get sick it doesn't last long. I really believe it is because of this simple routine along with healthy eating in general. I have been on the Greens for about 3 years now, and would not go a day without it! My acne has pretty much cleared up and I have noticed that my allergies are not nearly as bad as they had been before taking the greens. I am definitely more energized when I take the super greens on a regular basis. I use the super green every day -- it seems to help with my IBS, immune system, and joint inflammation. A true super food. Not only supports the body with quick absorption of vitamins and minerals, but also, gives excellent probiotic and enzyme support for the digestive system. The Super Green Food is a terrific supplement. Following a full knee replacement last year I found the healing was really fast and felt energized following the anesthetic and first days of recovery. Since I have been taking your super green food product I rarely get ill, the worst I've come down with was a slight flu. My energy level has improved as well as my skin and overall appearance. People keep commenting on how good I look and my girlfriends often ask me if I've had "something done". My husband has been consuming the greens every day faithfully for a couple years, he will be 75 in a few days, and can still out work me at 50, he swears by the greens and a positive attitude, with a whole lot of passion for life. Can pregnant women, infants, and children take this organic green food formula? Yes. This formula is made with whole foods only. Anyone - children, infants, and pregnant women included - can take these greens, though when pregnant, it is prudent to clear everything you take with your physician. Is this organic green food formula 100 percent raw and made of plants only? Yes. this formula is a 100 percent raw, vegan product, made out of the highest quality organic and wildcrafted ingredients available. Do your greens have to be kept in the refrigerator? How long does it keep for? This organic green food blend does not have to be refrigerated, although doing so won't affect its health value. Just be sure not to use a wet utensil inside of the jar. As long as you don't get the contents wet, the contents will keep for a minimum of three years. What kind of container does this formula come in? 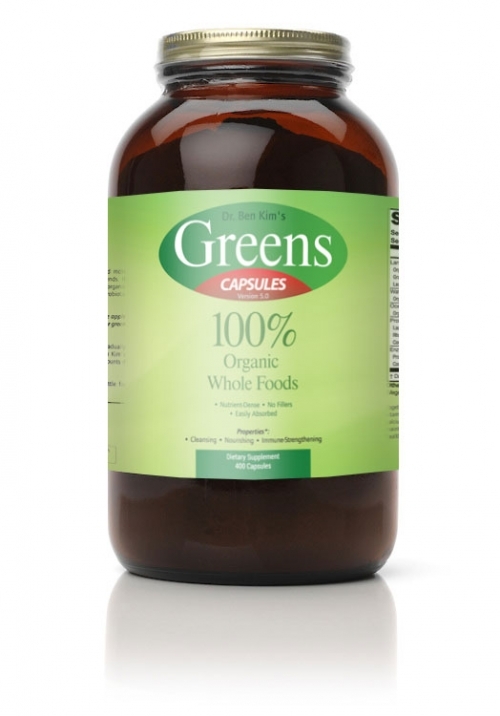 Our organic green food formula comes in an amber-colored glass jar with a metal lid for maximum nutrient preservation. How is this organic green food formula different from other green food products on the market? Many green food products use inexpensive fillers like lecithin, oat bran, apple pectin, apple fiber, seeds, and grains - these filler ingredients are fine, but in our view, they lower the overall nutrient value of a green food blend. Our organic green food formula includes only high quality, nutrient dense green plants, delivering highest possible health-enhancing value per ounce. If I take these greens, can I do away with my multi-vitamin? Does this formula have everything that I need in a nutritional supplement? Although our organic green food formula provides a wide variety of vitamins and minerals, it does not provide vitamin D, which is arguably the most common nutrient deficiency in first world nations today. If you are not already supplementing with vitamin D-3, you can include a source of vitamin D-3 along with this organic green food blend. Or you can look at our Organic Whole Food Multi, which can be taken as a stand-alone multi. Yes, our organic green food formula is 100 percent gluten-free. Verification: Please check the box below to indicate that you are a human, and not a robot. You may need to select some images as an additonal verification step. I have been using Dr. Kim's green capsules for 2 years. I tried using another brand but came right back to Dr. Kim. I have Diverticulitis and IBS-C. So having all these nutritious things in my body is essential. I have not worked up to Dr. Kim's recommended 9 pills a day, but with my new order I promise to take the full amount! I have taken the organic green capsules now for a number of years and have not had a cold or flu. I attribute this to these greens and recommend them highly. I tried the powder form, but much prefer the capsules. I am new to Dr Ben's Greens. I followed the suggested dosage. After about 10 days, my bowel removal has improved. I felt healthier, more positive, and energetic. I will continue with the Greens. I really like the Organic Greens Capsules esp. because of how convenient it is to take in capsule form. I bought this for my mother and she's on her second bottle. It has done wonders for her. She feels better and her constipation issues (which were chronic at times) have disappeared. This is a wonderful product. While many vitamin C products on the market contain synthetic forms of vitamin C like ascorbic acid, this product contains the full vitamin C complex that naturally occurs in organic acerola cherries, one of nature's best sources of natural vitamin C.
A highly effective professional grade probiotic blend made in Japan - excellent for improving gut ecology and facilitating recovery from dysbiosis and food poisoning.